A rich and intensely flavoured roasted red pepper soup made with juicy and charred red peppers, garlic, sun dried tomatoes for an extra flavour kick and topped with a homemade basil pesto and creme fraiche swirl. Mmmm because I love this soup and Summer is pretty much over in Scotland. 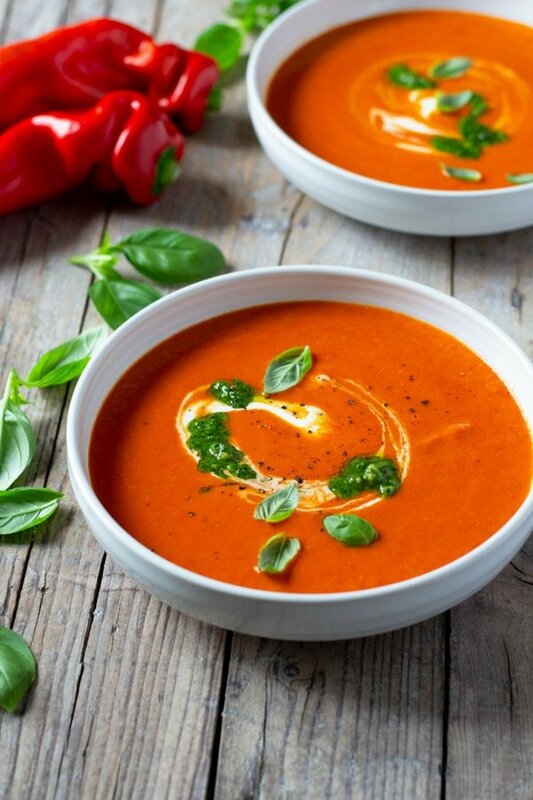 This roasted red pepper soup has a rich, thick and creamy consistency that you could eat it at room temperature during the summer months or nice and hot when the weather turns chilly. I never used to be keen on pepper sauces or soups because they always came out overly sweet to me but this red pepper soup has the perfect balance of sweet and tart flavours. I added a splash of lemon juice which really made a difference and the sun dried tomatoes totally transform the flavours from too sweet to perfect! Sometimes nothing beats a warm bowl of soup. Roughly chop the red peppers (bell peppers or sweet pointed peppers) and place in a large baking tray with peeled whole garlic cloves. Drizzle with olive oil and sprinkle with salt and pepper then roast in the oven until slightly charred (photos 1 & 2). Finely chop a white (yellow) onion and saute with a little olive oil until translucent and soft in a large pot. 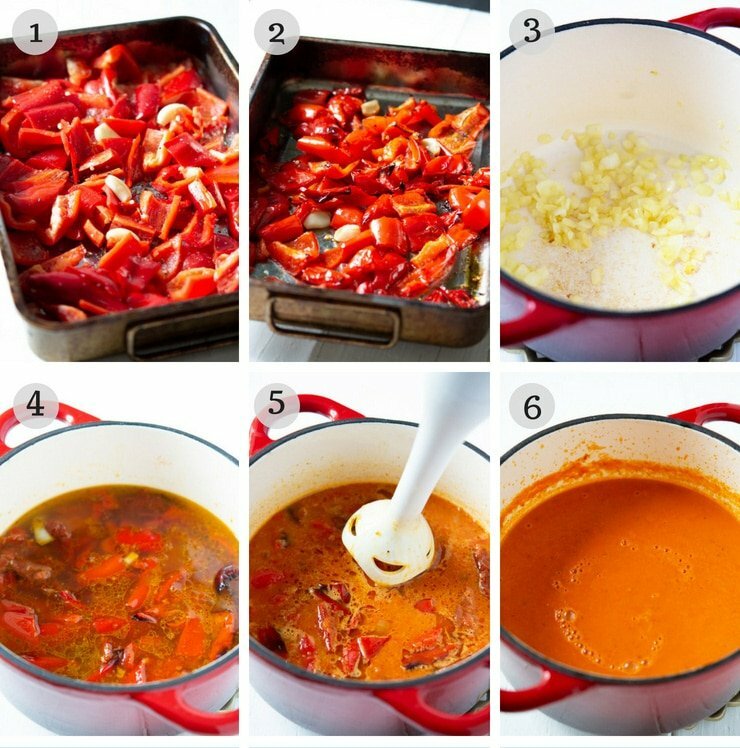 Once soft, add the roasted peppers and garlic, sun dried tomatoes and vegetable stock (photos 3-5). Simmer for 5 minutes then turn off the heat and blend until completely smooth using an immersion blender. Tip: At this point taste for seasoning, I only add pepper because there’s enough saltiness from the stock and sun dried tomatoes and pre seasoned peppers (photo 6). 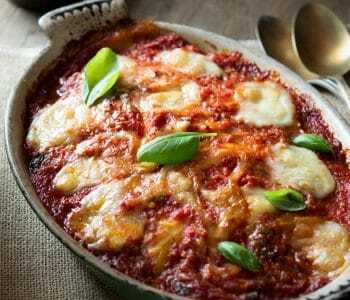 Add a small splash of freshly squeezed lemon juice, stir and serve with a drizzle of creme fraiche and homemade pesto. Grab a hunk of crusty bread and dive in. Pesto is pretty much the best thing on earth, right? I could eat it by the spoonful. If you know me you’ll know I’m talking about real homemade pesto and not that jarred stuffed that’s pretty much a lie in a jar. Ha, it just ain’t pesto folks…always go homemade or leave it out. The homemade pesto is swirled on top of the roasted red pepper soup with a little creme fraiche and it’s CRAZY delicious, find my recipe for homemade pesto here. Make sure you have a large enough baking tray so the peppers aren’t too crowded. They tend to stew instead of roasting and charring if they aren’t spread out evenly. If you don’t have an immersion blender you can use a normal stand blender, just pour or ladle it in from the pot. Once cooled you can store this soup in the fridge (minus the pesto and creme fraiche) for 1-2 days or freeze in suitable containers for 3-6 weeks. If you’ve tried this Roasted Red Pepper Soup or any other recipe on the blog please let me know how you got on in the comments below, I love hearing from you! You can also FOLLOW ME on FACEBOOK, TWITTER, INSTAGRAM and PINTEREST to see more delicious food and what I’m getting up to. 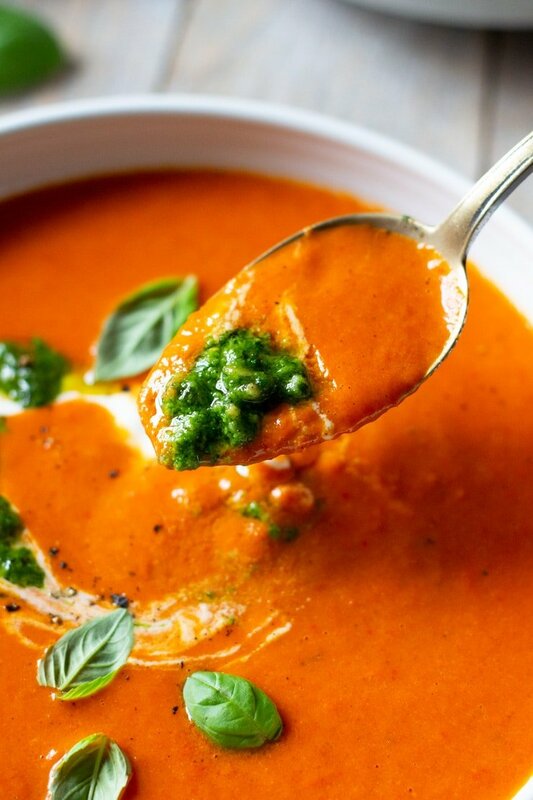 A rich and intensely flavoured roasted red pepper soup made with juicy and charred red peppers, garlic, sun dried tomatoes for an extra flavour kick and topped with homemade basil pesto and creme fraiche swirl. Roughly chop the red peppers and place in a large baking tray with peeled whole garlic cloves. Drizzle with olive oil and sprinkle with salt and pepper then roast in the oven until slightly charred (around 40 minutes). Finely chop a white (yellow) onion and saute in a large pot with a little olive oil until translucent and soft. Once soft, add the roasted peppers and garlic, sun dried tomatoes and vegetable stock. Simmer for 10 minutes then turn off the heat and blend until completely smooth using an immersion blender. Taste for seasoning, I only add pepper because there's enough saltiness from the stock and sun dried tomatoes and pre seasoned peppers. Make sure you have a large enough baking tray so the peppers aren't too crowded. They tend to stew instead of roasting and charring if they aren't spread out evenly. If you don't have an immersion blender you can use a normal stand blender, just pour or ladle it in from the pot. Hi, do we drain the sun dried tomatoes before adding them? Hi Danielle, I use sundried tomatoes in oil so you can either drain them from the jar or remove what you need and pat on kitchen paper to remove excess oil if needed. Thanks! This was so delicious! Grazie Mille! So happy you enjoyed it, Danielle, thanks so much! 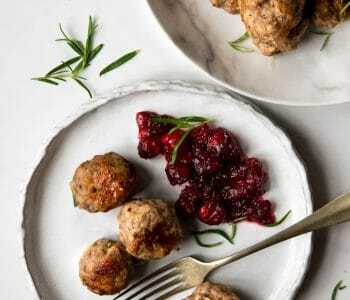 This dish looks absolutely delicious and your photography is gorgeous. I’ll be adding this dish to our weekly meal plan. Thank you so much, hope you enjoy! Thanks so much Danielle, they are so delicious in this soup! 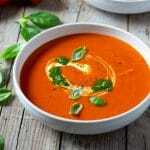 I’m a big soup fan and love roasted red pepper soup. Yours looks absolutely amazing! I’d love a bowlful right now. This soup is soooo beautiful!! Those colors are phenomenal, and I just love the pesto swirl!! This is getting pinned right now because it is a very precious recipe!! Aw thank you so much Camila! OMG, I love this recipe. No problem, thanks so much!